What type of support will I need? This is the No. 1 problem most people get stuck on. Forget about tree growth for the time being, the important thing to remember is that trees sway all over the place when it gets windy. You need to decide if your attachments to the tree will be fixed (bolted) or flexible. Flexible joints (also called floating point or suspended point depending on situation) hold up the support beam but still allow the tree to move. To begin with, don't use nails or screws to mount beams. They are simply not made to carry significant load. You should use bolts instead, and large ones at that (¾" diameter or more). Trees can deal with bolts quite well, but you should not place bolts too close together (less than 12"). This can lead to problems with compartmentalisation, where the tree reacts to foreign bodies by isolating the area. If you have two bolts just a few inches apart, the space in between can die and become unstable, reducing strength dangerously. Because trees move, you should use the minimum number of joints necessary to hold up the treehouse. If, for example, you are building a treehouse in a cluster of three trees, consider whether it would be possible to support the structure using just two of the trees, thus avoiding the complications of an extra moving attachment point. This issue relates to the spanning of gaps between trunks and limbs and causes a lot of worry and concern when people first hear about it. The choice is simple - fixed joints for connections between trees that don't move much and flexible joints for those that do. A lot of sources of treehouse information (including this site) will tell you that you must use flexible joints for large structures, but for houses in very small trees it really doesn't matter very much. However, make sure you know what you're up against! If the branches are not very large or heavy, you may be able to simply attach your supports across them. The small stresses produced by wind can be accepted by the supports. The complete floor structure will then need to be rigidly fixed to itself with strong fixtures (large nails or bolts) so that the stresses don't break the joints. This method is not suitable for large spans or for use between thick trunks. I'd recommend it only on branches less than six inches in diameter. This is the best choice of framework because very low stresses are created in the support framework so smaller dimensioned wood (cheaper) can be used. However, it is more complicated to build. 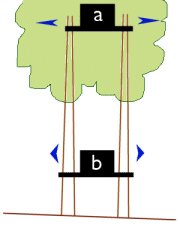 The idea is that one end of a beam is fixed to one trunk or branch, and the other end is supported by a sliding joint. When either trunk moves, the support slides across the joint and no big stress is put upon it. The simplest sliding joint is a metal bracket in a 'J' shape. This is bolted onto the tree leaving a space where the beam fits in (the hook of the J). The beam is then free to slide in one direction easily. This is a good reliable and rigid method, but isn't suitable where the beam may get twisted sideways in the bracket. You will then need to choose a different design. Another type of flexible joint is used by Pete Nelson for his large professional treehouses (see TreeHouse Workshop, his company). It is basically a sling made of steel cable which is fixed at one end to the support and to a higher branch at the other end. This is cheap and effective but you need to be very careful that the tree doesn't come in contact with the moving cable. Suspend the cable from an eye bolt fitted to the tree at right angles to the direction of the cable and fix it to the support with another eye bolt. This is important so that when the wind moves the support, the cable doesn't rub away the living bark and damage the tree (more on tree damage). See also the page on flexible joints for ideas. It is not particularly the weight or size of the treehouse that determines whether joints need to be flexible or not, it is the tree. As explained above, my treehouse exists in a tree where it is bolted rigidly in position. It isn't going to fall down because the trunks holding it up don't have much power to break the joints. The trunks are thin and are near the top of the tree (see a in the diagram to the right). The danger comes when you build closer to the ground. Trees can catch a lot of wind—an effect which swings the whole tree around. Near the ground the trunk acts like a giant lever, magnifying the strength of the wind into an incredibly powerful force that only moves an inch or two. This is similar to the large movement on the handle of a hydraulic jack which translates to a force at the piston large enough to lift a car or truck. Now you can imagine what the bolts holding treehouse b in the diagram are going through when it gets windy. A fixed system will be under immense pressure and can easily break. This is the situation where a flexible system must be used. You might have read how I put up my treehouse. I fixed two horizontal beams onto four separate trunks of the same tree and set a solid floor on top. I originally used nails to attach these beams, only to discover after a storm that some had sheared off, leaving parts of the treehouse held up only by parts of the extensions they were patched on to. This alerted me to the amount of force that trees in the wind could generate, so I upgraded the joints to bolts to solve the problems. My treehouse was about 7/8 of the way up the tree so the four trunks are mostly around 6" thick. There wasn't a lot of leaf area above the house so the bolted supports were strong enough to withstand the forces generated. This system worked for me and continues to work for hundreds of treehouses around the world. So sometimes you can directly bolt beams to the tree and it is easier for the builder. More specifically, you can use a fixed attachment system in a tree where the relative motion of limbs and trunks can be safely contained in the supports, ie at the top of a large tree, or in small trees. But the supports must always be capable of withstanding the wind and of maintaining their structural integrity even after a big storm. When one end of the beam is fixed and the other can allow for tree movement there is no build up of pressure and the floor network will withstand very heavy storms. The house itself may get damaged by high winds, but that is a design concern that should not to confused with tree movement.